Sometimes shore calls us, and however much we do not want to, we have to put our boats on shore for a short period of time. Here is a checklist of items to help ensure your boat is in tiptop shape when you are ready to set sail again. Clean the entire boat. 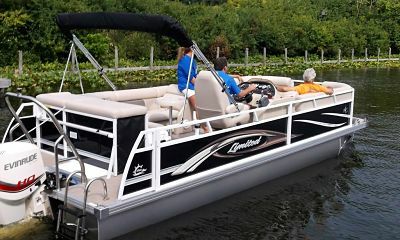 Just as if you were storing it for the winter, make sure that the boat is clean inside and out. It will accumulate grime while sitting, but do not allow fresh stains to become hardened, or a soiled interior become moldy. Lock. Lock your boat and leave the key with a responsible person if you will not be close by. Security. If you are not going to be near the boat while it is stored, it is a good idea to have someone you trust check on it regularly. Prevent animals from entering. Ensure that there is not easy access for critters to make a home in your boat while you are away. Do not leave ladders and ramps leaning against the boat. Moth balls left on blocking and on the boat will deter their entry. Try not to store the boat underneath trees or in known wildlife areas. Block. Make sure the boat is blocked securely. If you are uncomfortable doing this, call in a professional. Boats on bunk trailers can be stored on the trailer. Boats on roller trailers should be blocked and the trailer can be left underneath for safety. Other maintenance. Refer to your maintenance schedule and complete any other maintenance items that are approaching. Refrigeration. It is a good idea to empty refrigerators, clean them, and turn them off while the boat is stored for any length of time. Leave the door partially open to ensure air circulation. Sails. Sails should be dried and properly rolled for storage inside the boat. Mast. It is not a good idea to store a sailboat with the mast up. Remove it and secure it either to the boat, or in a proper storage facility. Lines and fenders. Lines, fenders, and other equipment should be cleaned, dried, and stored inside the boat and away from the sun’s harmful rays. Any equipment that must be left on deck should be cleaned and secured. Cover. Depending on the length of time and the conditions under which the boat is stored, you may want to cover it. Engine. Close the fuel outlet from the tank and run the engine until it is out of fuel. This will prevent fuel from gumming up your carburetor(s) or injectors. It could be a good idea to fog the engine(s) if the storage is of any length, or if serious changes in weather conditions that could lead to moisture build-up, are anticipated. Drives down. If you operate a boat with inboard/outboards, make sure the drives are in the down position for storage to relax the boots and protect access to them. Remove propellers. If the boat is to be stored in an area that is not secure, you should remove the propellers and outdrives as appropriate. Drain and flush the cooling system. Salt water and fresh water alike should not be allowed to remain in the engines. At the very least drain them, but especially in the case of salt water, make sure they are flushed. Fuel system. Today’s fuels require stabilizer if they are to be left for any length of time. Either fill the tank(s) and add enough stabilizer to secure the fuel, or drain the tanks completely. Check with your storage facility and your insurance company for their regulations. Water separator filter. Remove any water separator filters and install new ones. Batteries. Ensure your batteries are charged and provide for a battery tender if possible. Lubricate. Take this opportunity to add lubrication to cable ends and other items. Drain the bilge. Remove the drain plug(s) and drain the bilge. Ventilation. Make sure the boat is ventilated so that fresh air can flow through it. Changes in temperature and humidity can have a detrimental effect on the interior without proper ventilation. While it may be a bit of work to prepare your boat for short-term storage, ensuring that you do it properly will mean a faster return to the water.